Mori never played in NPB - he attended Kinki University and played in the corporate leagues for Matsushita Electric/Panasonic* after graduating. If this is to be believed (and is kept updated) he played for Panasonic from 2008 to 2014. Cool card. Is that a sticker auto, or did he just sign off centered? It's not a sticker. The card is extra thick, like it was put together in multiple layers. I suspect he signed the lower layer and the upper layer (with the opening to see the autograph through) was put on afterwards. (I also suspect that there's some common term for this in card circles but I don't know what it is.) In this particular case the autograph didn't quite fit into the window. Lol. I remember building the jersey set. Clicked on your link and was soon reminded that I paid $25 for the Yuki Saito jersey card. Had to double check, so I downloaded my COMC purchase history and there it was. $27.92. That has to be one of the worst purchases I've made since I've returned to the hobby. @Fuji - If it makes you feel any better I think I spent $30 on that card. Was Saito suppose to be the next big thing or what? What possessed us to pay so much money for this card? Oh Lordy, yes indeed Saitoh was once believed to the next great thing. 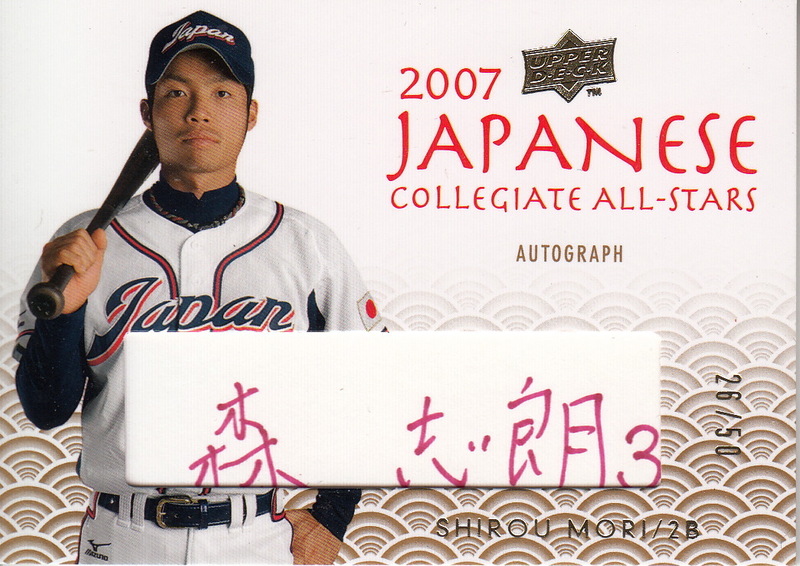 He had an epic performance in the 2006 Koshien tournament including a 15 inning match up against Masahiro Tanaka in the title game which ended in a tie - I've written about it a couple times in the past both in 2013 and in 2018. He was hugely popular after this. I believe the Upper Deck card was his first baseball card ever. I've been convinced for years that BBM only did collegiate sets from 2008 to 2013 so that they could make collegiate cards for him.